In the United States, a whopping 40 percent of food grown or raised is not eaten. That’s pretty shocking, especially when you consider that nearly one in six Americans is food insecure, and that 25 percent of all fresh water and 300 million barrels of oil are used to produce the food that is wasted each year. The vast majority of that waste — 95% — ends up in landfills where it’s value is lost forever. This waste occurs all along the food chain from farm to fork. Food is wasted at the farm due to overproduction, market fluctuations and strict aesthetic food industry requirements. Food is damaged or lost as it is packaged and shipped. More food spoils in overstocked retail outlets and home refrigerators. While this is certainly cause for dismay, the good news is that there is another way. The vast majority of food waste can be eliminated all together or used to feed the hungry, feed animals, or to create new soil or energy through composting and anaerobic digestion. 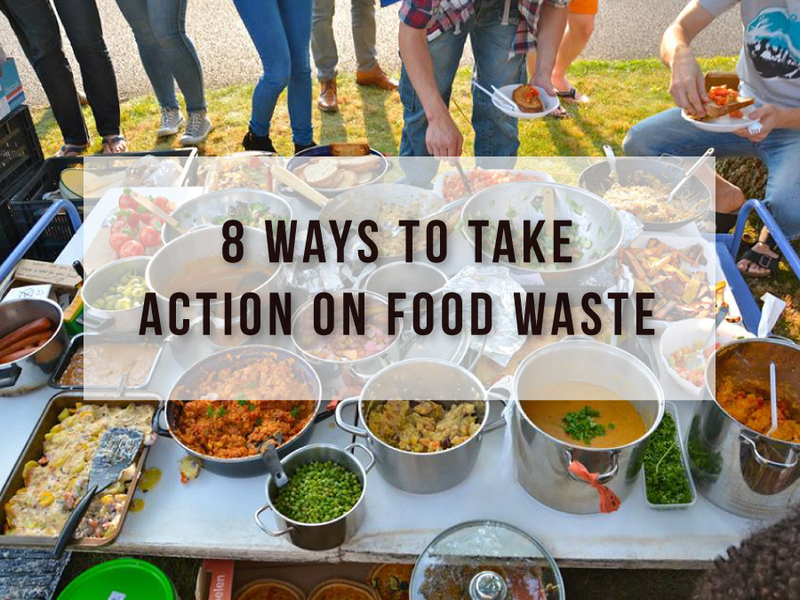 Ready to take action on food waste? Here are eight steps you can take to help reduce food waste in your home, community and across the nation! The most important step you can take to reduce our nation’s level of food waste is to reduce your own personal food waste. To get started, try keeping a food waste journal. One easy way to get started is by taking our I Value Food: Too Good to Waste challenge. In this 6-week program, you’ll keep track of how much food you throw away and why. This helps you determine both what you’re wasting and what you can do about it. Solutions range from planning meals ahead of time to creating new cooking and food storage habits to technology solutions, such as food-sharing apps. Consider bringing the “I Value Food” message to community groups you’re involved with, like your workplace, church or children’s school. Start by asking them to share information about the food waste issue in an upcoming newsletter. Then look for ways you can help them prevent and reduce waste, like donating extra food from cafeterias or meetings to shelters or starting a composting program. If you already have a “green team” or employee engagement program, consider adding food waste to your group’s action items and taking a food waste challenge together. There are a lot of restaurants and grocery stores making strides in sustainability. Get to know which ones in your area are working to prevent food waste. Ask businesses if they donate excess food to feed the hungry or if they compost their kitchen scraps. Do they try to incorporate nose-to-tail food use philosophies? If so, let them know you appreciate their work. Some might be surprised by your questions, but raising the issue raises awareness and starts the conversation. Search for “sustainable,” “slow food,” “zero-waste” and “green” restaurants to find businesses in your area. Whether it’s a pilot composting program in your city or a state-wide ban against food waste, like Massachusetts recently enacted, state and local governments have the means to enact programs that can reduce wasted food on a larger scale. Develop a set of ideas or recommendations and identify the appropriate person/s to meet with in your community. Identify potential allies such as like-minded local environmental or hunger relief organizations. Let your elected officials know that food waste issues are important to you. One issue to target is food date labels. Did you know that “Best Before,” “Sell By, “Use By” and other labels are not regulated by the federal government and mean different things in different states or to different manufacturers? This lack of standardization results in consumer confusion and the wasting of billions of pounds of perfectly good food. (According to a survey by the Food Marketing Institute, misleading food labels lead nine out of 10 Americans to needlessly throw away food!) Learn more at http://www.nrdc.org/food/expiration-dates.asp and contact your local legislators to take action. (Here’s how to find your elected officials). Sustainable America travels across the country hosting events to raise awareness about food waste in the U.S. If you’re interested in collaborating on an event in your city or town, email us at [email protected].